It's been eating away at me for years now, I have skied and skibiked all over Europe, but when I get home I look at the slopes that surround my home and wonder to myself, what would they be like with enough snowfall? Luckily, this time last year, there was enough snowfall for me to SkiBike on Riddlesdown on the other side of the valley, where I live. In the last few days we have had quite a few inches of snow, but no more was forecast and there is the strong likelihood of a thaw soon. Irritatingly, I have left all my skibike stuff in Geneva for safekeeping and even my trusty SnowBlades are at Finches for a well earned trip through the belt sander. But I do still have a pair of ski boots with me and some footskis, that I made a year ago, which have only been used once. If you haven't read some of the older posts on this Blog, you may not know what they are. Footskis are very short 60cm skis used with ski boots as support outriggers when skibobbing, the pre-cursor to modern freestyle skibikng and still common and popular in Eastern Europe. Furthermore, footskis can be used to scoot around on, just like a very short SnowBlades, although there isn't much ski behind your heel, you do need much more finely tuned balance skills than the average lazy skier. Today I had to attend a meeting, make phone calls and do numerous other chores. I did manage to squeeze in a quick 6 mile ride into Croydon and back, but the imminent thaw had been bugging me all day. At the same time, in spite of having skied many red and even black runs within the last month, I had no idea how tricky it would be to ski a London street. At 10pm the urge could no longer be resisted, I decided there was only one way to find out, I donned the added protection of knee and wrist braces, slipped into my ski boots and walked out into the unknown. 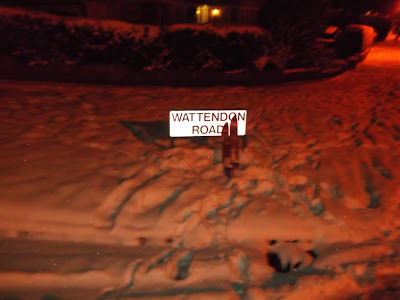 Well meaning neighbours had successfully cleared swages of pavement of snow, rendering them unskiable, so with my baby footskis grasped in one hand, I headed higher up the hill to Wattendon Road, the one road that never gets cleared of snow, is never salted and is always a great road to test your ice driving skills. 15 minutes later I was at the junction of Wattendon Road and Firs Road, surrounded by quiet bungalows owned by curtain twitching retirees, here, the chances of meeting an oncoming car were slim. The end of the road provided a gentle "green run" gradient for the final 30 metres where it meets Firs Road. I clipped in and stepped onto the road, slowly skating towards the junction abruptly I was off, barely moving above walking pace, but skiing on a road in Kenley, London. 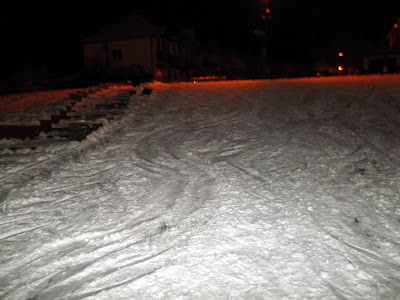 The cars that had successfully negotiated the road had compressed the snow into slalom competition levels of slickness. It wasn't a pleasant experience but with my primary target completed, I headed back down the hill. There were some steeper roads nearby, but they were sheltered by trees, what little snow hadn't been cleared had already melted. Clomping along the road I began to appreciate how much snow really falls on the mountains to sustain the runs and also how carefully it is managed and augmented by artificial snow making on delicate sections. Of course in the Alps you won't find many runs below 1000m or 3000', here in Purley we are just 95m or 300' above sea level, even 500 miles further North in Scotland the runs don't start until 300m or 1000'. An ideal snowfield needs to be on a North facing slope, to avoid the melting effect of the sun, be clear of overhanging trees, have a level, rock free surface and a reasonably constant gradient. 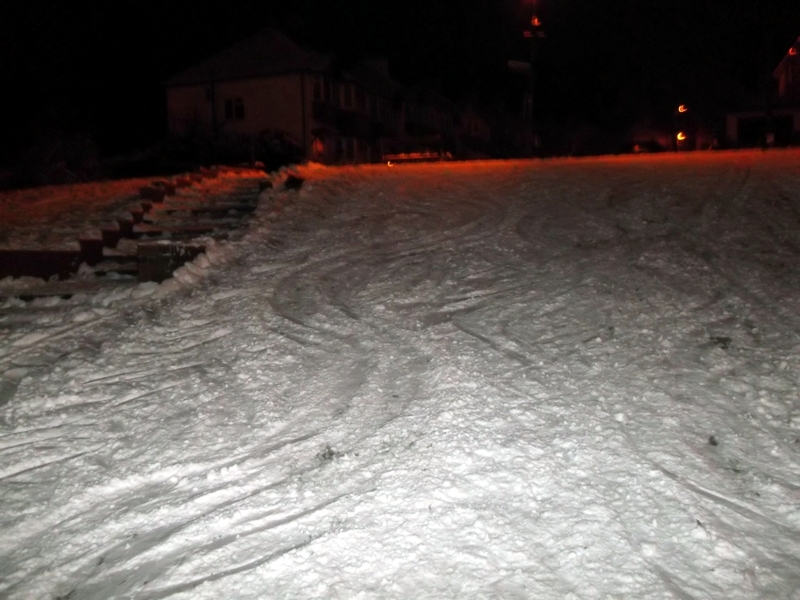 Not 100m from my house I passed just such a slope, the local kids on plastic trays had done a very effective job of compressing the snow, yet unlike the road it hadn't been turned into hard ice. Sneakily, I popped back into my foot skis and lined myself up for a run, in my head I could see the headline in the local paper "Must have been piste... local ski enthusiast found dead on the railway tracks", but this was time to think positively. The first run went well, no unpleasant surprises, time to up the ante, I sidestepped back to the start and with each descent started to get a little more dynamic. 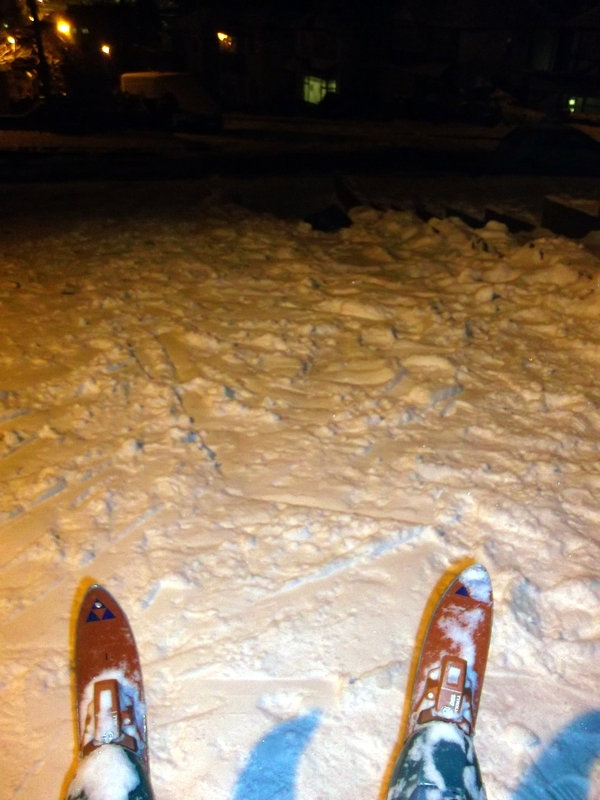 How weird, I was really enjoying this little slope within spitting distance of my home. I found it was less effort and quicker to Herringbone back up to the start, then turn around and see if I could get in another 4 or 5 turns before I reached the road at the bottom. Within 10 minutes I had broken into a sweat, I took off my hat to expose my steaming bald head. A few late night walkers passed by discretely without comment, they must have thought that I had broken out of a mental unit. "Oh look at him, bless, he seems to be having so much fun". After 45 minutes I realised that all that uphill climbing in heavy ski boots was exhausting, it was midnight and I was yet to have some dinner. 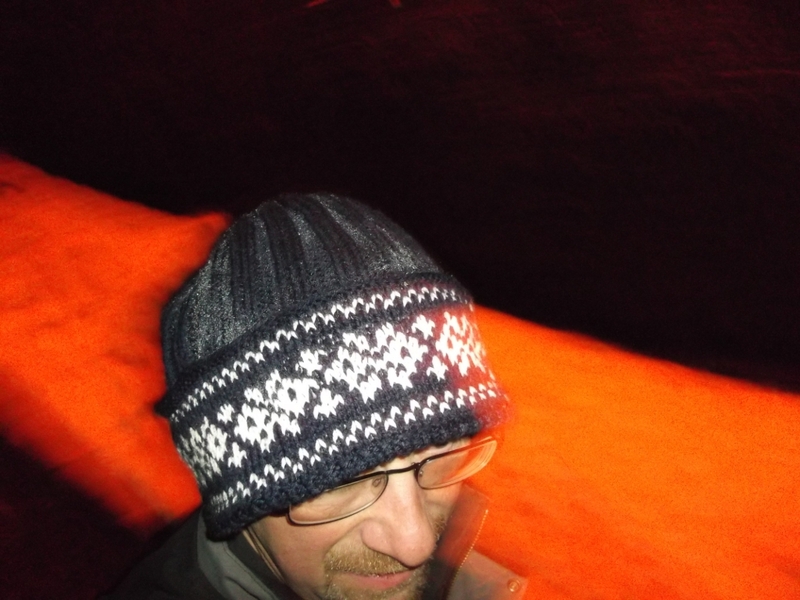 With a happy glow, I trudged back for some much needed sustenance; roll on the onset of the next Maunder Minimum and I had better start scouring eBay for a used chairlift this summer.